I was teaching my son how to drive and, of course, he bumped the car on the side of the garage door. I kind of panicked, I must admit, and when I got out of the car I noticed that the garage door tracks were bent. I didn't want to make matters worse and just called Jericho Garage Door Repair. I totally trust this garage door company. Any why wouldn't I? Their response is quick and their work is outstanding. Indeed, the technician fixed the problem within the next hour. I appreciated the immediate service! The truth is that I don't pay too much attention to the condition of garage door parts and wouldn't know what to do if the door would start malfunctioning. With that said, I absolutely trust the competence of the technicians at your company since they come very fast every time I call. I'd really like to thank you for such quick response and express my gratitude for making me feel safe just by knowing that you'll be here if something goes wrong with my overhead door. Plus, I appreciate the excellent work of the technicians! 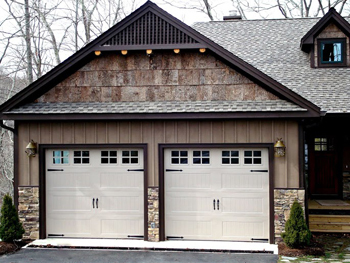 Garage Door Repair Company in Jericho provides unparalleled service all the time. They were the ones that installed our garage door and the only company we trust for repair and maintenance. Anytime we need them, they are just a phone call away. Whether it’s a small or a huge problem, we felt that they always put our needs first. They are knowledgeable and experienced in all areas regarding garage doors and openers. Plus, they are really nice and that’s why you would feel comfortable asking them anything. They recently helped us purchase a new garage door opener and installed it. It had a backup batter so even when power is out, we can still use it. I don’t think I’ll ever find such a great opener without their help. When the techs of Garage Door Repair Jericho came to fix my garage door springs for the first time, they advised me to have them replaced. The truth is that I didn't listen. I wasn't sure they were right until I noticed that springs needed services more and more often. I called the company back and they told me that it would cost me less to replace the overhead door springs than keep repairing them. They were right. They had them replaced at my convenience and as they said my expenses for repairs stopped. Their work was great.